Why Buy From Germain Ford of Columbus? 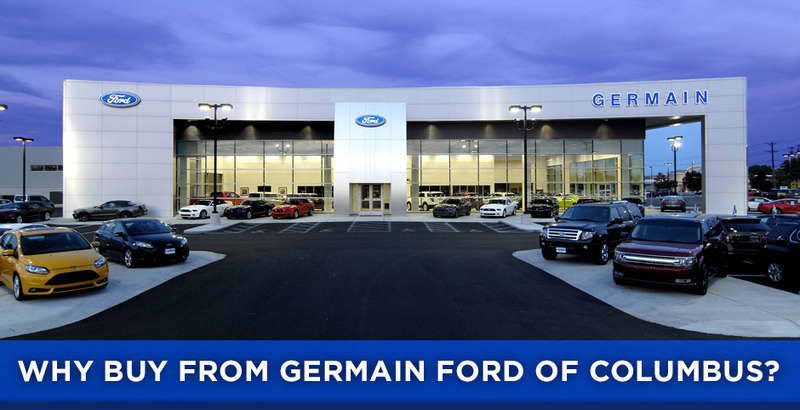 Buy from Germain Ford of Columbus for First-Class Service! Here at Germain Ford of Columbus, we take pride in doing things a little differently than other dealerships. We put more time and energy into building relationships that last than we do pushing for a single sale, making you feel comfortable and confident as you work your way through the car-buying process. It's plain and simple: owning a car should be a fun experience that's built around your needs. After all, our customers are the one thing that keeps us going, and we'd be hard-pressed to ignore their top priorities. If you're interested in joining the Germain automotive family, our staff would love to meet you. We're a part of a larger group that has dealerships all over the region, and we have years and years of experience providing drivers much like yourself with everything they could need. We have a special process that we've refined over the years, and we're fully confident you'll find it truly rewarding if you bring us your business. Whether you're in search of a new Ford vehicle like the F-150 pickup, Focus sedan or Explorer SUV, or you just want routine service or financial advice, our Ford dealership near Dublin, OH, has the perfect solution for you! • The Germain family of dealerships is a family-owned and -operated group that first opened its doors back in 1947. That means we have decades of industry experience and knowledge we'll use to better serve you! • We offer the Germain Ford $1000 Price Promise, which means you get the most competitive price on all new Ford models. • Our 3-day money-back promise allows you a bit of freedom in case you aren't totally in love with your car within the first 72 hours! • Thanks to our pick-up and drop-off service, customers can always find a good time to get their car in the shop. • Just getting a quick service procedure? Feel free to wait around in our customer lounge and enjoy complimentary coffee, snacks and Wi-Fi! • Our entire team is dedicated to giving back to our customers and community. We take great pride in support many causes in the community like Nationwide Children's Hospital, The James Cancer Hospital, The Ohio State University and more.